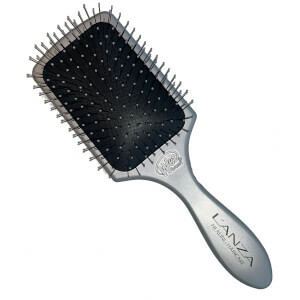 L'Anza's Healing ColorCare Mini Gift Set has been carefully curated to prolong and enhance the look of your colour-treated hair. The shampoo and conditioner cleanse, nourish and protect against fading, while the dry shampoo rescues second day hair. Perfect for on-the-go, the gift set is complete with a complimentary travel pouch. Formulated with natural Gugo Bark, the creamy, sulphate-free shampoo forms a luxurious lather that effectively cleanses hair without stripping away hair colour. It’s fortified with a Flower Shield Complex®; containing anti-fade protectors extracted from flowers that form a protective barrier and prevent colour fading. Hair is left feeling refreshed and nourished with a vibrant hue. The daily conditioner infuses hair with essential nutrients and moisture that helps maintain and preserve colour. Enriched with the Flower Shield Complex®, it strengthens hair fibres whilst shielding hair from external aggressors that lead to dullness. Locks feel more manageable and detangled with a mirror-like shine. A residue-free dry shampoo that revives the appearance of day-old hair. Providing a just-washed boost, the dry shampoo helps to absorb oil and impurities without leaving unsightly powder in its wake. Formulated with Hectorite Mineral Clay Powder, which is naturally invisible and provides extra absorbency without the residue. Rescuing lack-lustre locks, the formula lends hair low hold factor for loose styles, and contains the brand's exclusive Keratin Cactus Complex, which helps to heal the hair while styling for enhanced manageability and lasting effect. Conditioner: Apply to wet hair and rinse thoroughly. Dry Shampoo: Apply to roots of hair from a distance of 20-30cms and leave in.